After being stunned by Brexit, Richard Shaw created a news recommendation engine to get himself, and the rest of us tied to news brands and perspectives by preference, out of an echo chamber. It all started when Richard Shaw wrongly predicted that the United Kingdom would stay in the European Union. As a former market researcher, and one who was always well tuned into political news, he was confident that he could predict how people would behave. “I had read all of the news articles, spoken to friends, listened to the experts,” recalls Shaw. “I understood it would be close, but I was confident the UK would decide to remain in the EU.” Shaw was very, very wrong. Sound familiar? Political comedian and commentator John Oliver was so confident that Trump would lose that at one point Oliver said to him, “I will personally write you a campaign check now on behalf of this country which does not want you to be president but which badly wants you to run.” Oliver’s confidence levels were similar to that of millions of people, but perhaps for different reasons. For much of the rest of the country, as Shaw would conclude, certainty was a misleading by-product of hearing the same positions over and over from a detrimentally small selection of favored news sources–we were reading and watching what made us comfortable, not what made us aware. After being blindsided by Brexit, Shaw realized he had been living in an echo chamber–all his news sources were saying the same thing, leading him to a skewed view of both the present state and possible future outcomes. He knew this had to change. 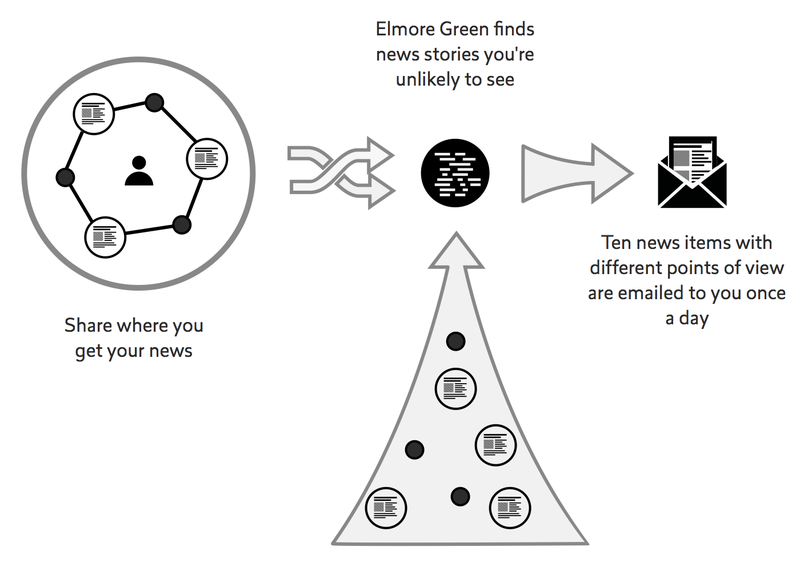 Shaw set to work creating Elmore Green, a news recommendation engine that would feed information to people based on one major factor: it was information they weren’t likely to receive during their regular course of activity. You can think of it almost as an anti-Facebook newsfeed. Our social streams are shaped by what we like, share, and react to, which in turn leads us deeper and deeper into the echo chamber, where all we hear is the voices of those who think like us. Elmore Green provides new, fresh, contrary sources of news. But as Shaw recruited beta testers, analyzed the data, and asked the early adopters about their reading habits, he was able to create an algorithm that pulled news from sources across which they would rarely come, and in some cases, even actively avoid. 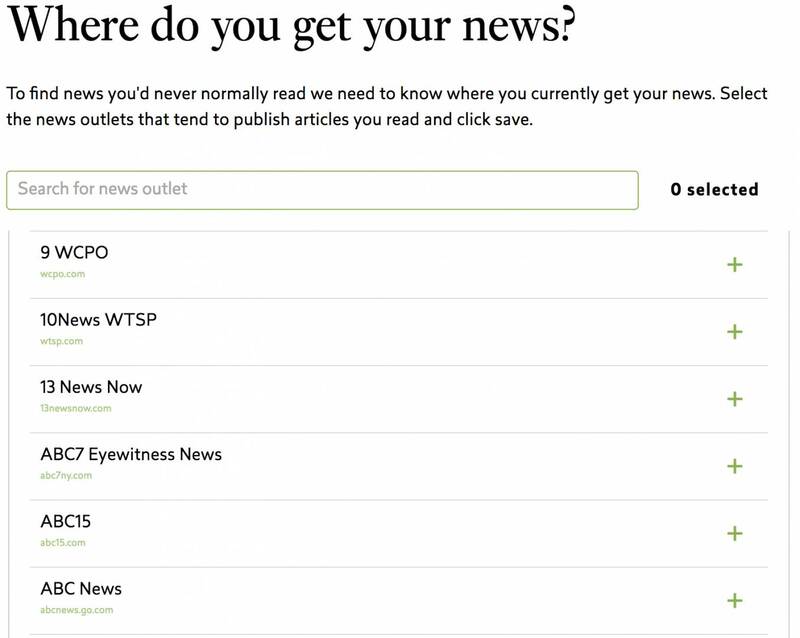 The process begins when, after signing up, users select the sites where they commonly get their news. Of course, for Elmore Green to succeed in the long term, it will need to be monetized. Shaw is hoping that a subscription service will allow him to generate revenue from users. With that income, he hopes to be able to develop original editorial content that highlights biases in media coverage. While I can’t help but appreciate the concept of the site, I do wonder who will be willing to pay for a subscription. Given that most people are happy in their ignorance, will they want to shell out cash to hear that they might be wrong? There is clearly a fundamental need for a service like Elmore Green. Hilary Clinton’s stunning defeat and the thousands of embarrassed analysts, let alone regular civilians, are proof of that. Maybe if enough people sign up for this service, we can avoid similar situations in the future. John Oliver, if you’re reading this, maybe consider checking it out. I hate the news, usually. Of course, I don’t mind reading the occasional technology article that has to do with a gadget that I own, but that is about it. There is so much garbage to filter through it’s no wonder people cannot just find a nice and relax and read. Can this service be setup for ANY category of news? I was wondering the same thing, so I went to the website. I am not sure. I would not mind crawling into a hole for a little while. There is STILL so much noise since the election. This makes sense and I am curious as to why something like this wasn’t around sooner. For the most part, news is all bad news. Its just like looking for the news network that ONLY talks about the good. I found the Good News Network and am pretty happy with that. Of course, the normal news reader is not going to want to read anything opposite of their opinion, that is why they read what they read. However, without a subscription based model, I am not sure there is another way to monetize. Yeah, that is true. I am going to try the service to see really how authentic it is. After all of the election BS and Facebook being involved, not involved and all of that, I would be happy to get my news from nowhere. Just to disconnect and not be bothered by news from anywhere in the world. Of course, this system is good for when I want to be “connected” again.